A group rate/fee available for 15 people or more. ※With 1 ticket, you can view 2 places “Ryusendo” and “Ryusenshindo science museum”. ※The consumption tax is included in the admission fee. 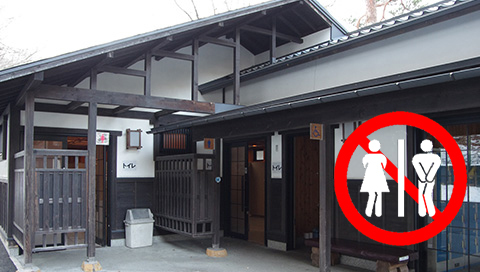 ※If you have a handicapped Person, you will be charged a discount. Please present your notebook at the counter. Because Ryusendo Cave is a designated natural monument, it is forbidden to touch, break or damage the precious stalactites, stalagmites, etc. 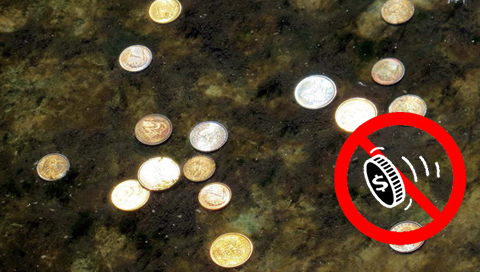 So that its water remains clean and uncontaminated, please do not throw coins into Ryusendo Cave’s waterways or underground lakes. There is no toilet facility in the cave. Please visit the toilet before entering the cave. 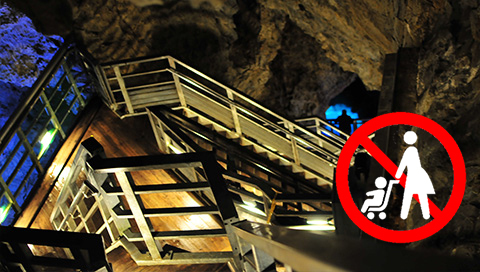 Because of the stairs in the cave, please leave your baby stroller at the office. 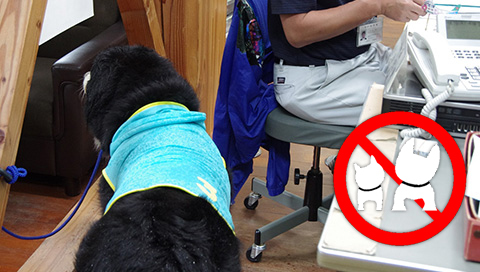 To protect the cave’s ecosystem, pets are prohibited from entering. Visitors` pet may be left at the office, but we appreciate some consideration (e.g., bring it in a cage) since we often look after numerous pets at once. Also, please contact us in advance if the pet is large or you have multiple pets, etc. 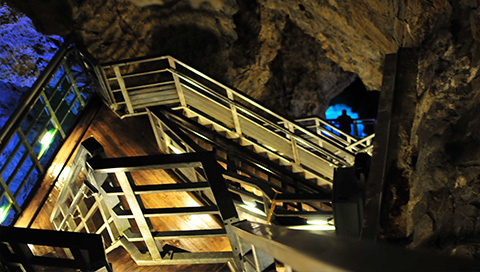 The long and steep stairs in the cave pose a safety risk for anyone affected by alcohol. Also,if suspect that your entry could possibly present a nuisance to other visitors, we may advise you accordingly. Eating and drinking are prohibited in the cave. 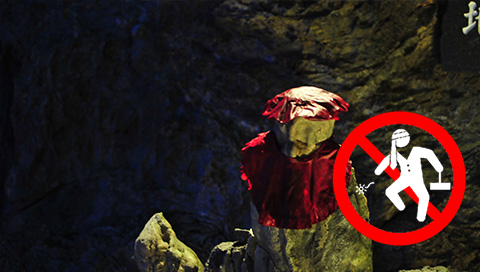 No smoking allowed in the cave. 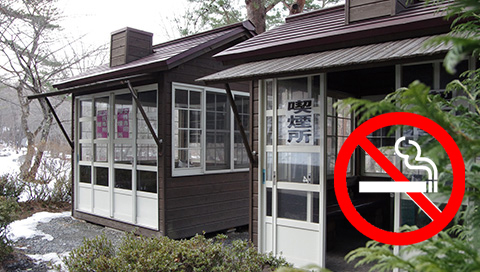 Smoking areas are set aside in the Ryusendo`s common area. The cave’s year-round temperature is stable at approx. 10°C. You may need an extra garment (or jacket) to keep you warm, if wearing light, particularly in summer clothes (e.g., a short-sleeved shirt or shorts). 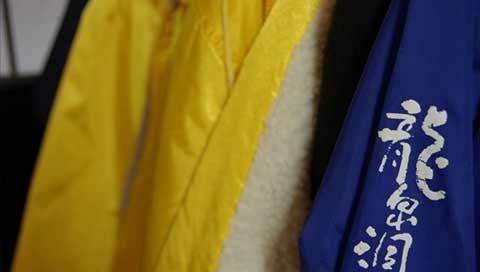 We lend windcheaters, so please contact the office if required. 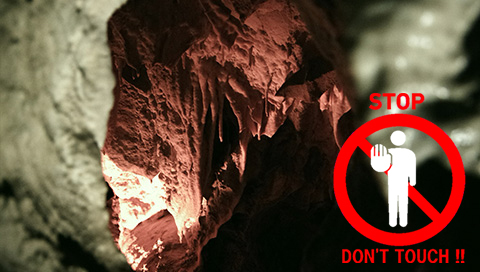 Please wear comfortable shoes suitable for walking in the cave. 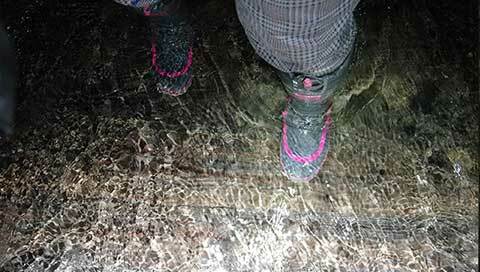 The floor is wet due to the water dripping from the ceiling and some parts of the stairs are steep. 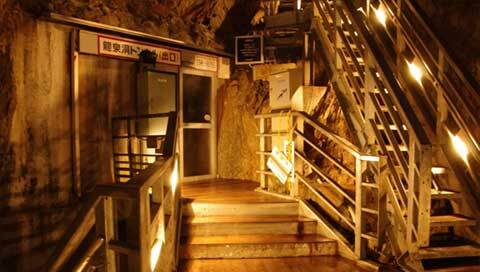 At the Third Underground Lake which is deep inside the cave, marks the starting point of the staircase. Because the staircases going up are very narrow, it is not possible to turn back half-way along it. So, it is recommended that anyone who is not in good physical condition, with infirm legs or suffering from acrophobia, to retrace their steps back along the same route from the Third Underground Lake, without attempting to go up the stairs. ※ As an exceptional situation, when the route is made one-way only at a peak season, please be aware that everyone must climb about 50 steps ahead and exit via the exit tunnel. Since Ryusendo is a ‘living’ cave (i.e., continuously growing without drying out), some water always drips from the cave roof. When it rains, the rainwater seeping through the ground drips more than usual. Although the amount of water dripping into the cave is proportional to the amount of rainfall, there may be a time lag before the rainwater begins to fall from the cave ceiling, depend on the time taken to seep through the surface of the ground. 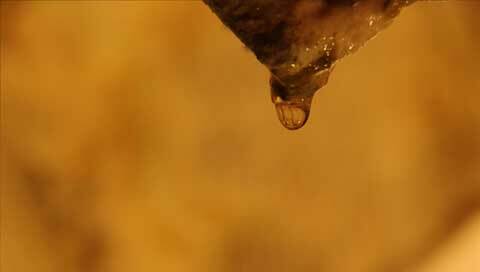 So you may find heavy dripping in the cave even when it has stopped raining outside. When dripping especially severely, you may rent/borrow an umbrella and raincoat from the office. Certain areas are prone to be affected early in the tour route, and here we first erect scaffolding as soon as flooding occurs. We put your safety first and close Ryusendo Cave if the water increases to a dangerous level. However, the Shindo Science Museum will stay open. The busiest and most crowded time for Ryusendo Cave is during the Golden Week (early May) and the Bon festival (mid August) . During these busy periods, in a single day as many as 6,000 people – or more than 1,000 people per hour – may enter the cave. Normally, the entrance and the exit share the same location, and the paths going in and coming out of the cave overlap at some points. However, this usual route arrangement changes in the busy peiords to avoid congestion in the cave. The tour route becomes all one-way,and the exit is through a exit tunnel after climbing about 50 stairs from the Third Underground Lake. However, congestion might remain severe despite these measures, and we may guide you to first visit the Shindo Science Museum (covered by the same ticket). The busiest time of the day is between 11:00 am – 2:00 pm. A visitor arriving in a wheelchair can enter the cave providing the following conditions are agreed to. ① After reaching the two-thirds point of the journey (just before the underground lake), which is where the staircase starts, you must return by the same route (partly in reverse mode) to the cave entrance. ② Before starting, you must change to our wheelchair in the office, because it is impossible for a normal wheelchair to pass some of the narrow passages in the cave. ③ In the busy season, when the tour route become one-way only, you may have to wait until it is less congested so that you can make a return trip (partly by going backwards in reverse mode) along the original route to the exit. 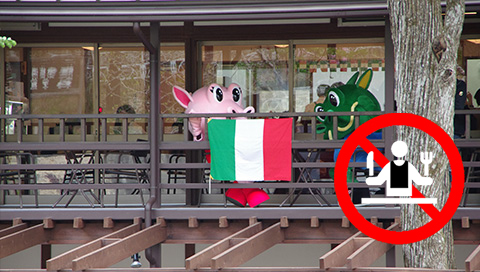 One is located within the park, and the other is on the second floor of the Resthouse. 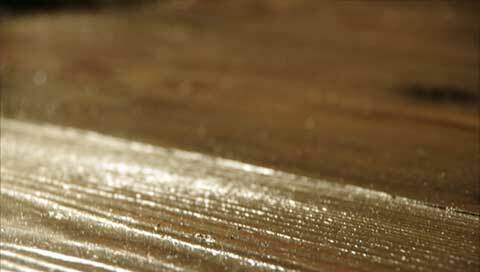 The Ryusendo office also lend walking sticks to make it easier to walk in the cave. An electric chair is avaialble for anyone finding it difficult to go up to the second floor of the Resthouse.